The other day, I was at the local fishmonger just before they were about to close for the evening. It’s my favorite time to go, because everything goes on sale. On that particular day, there was still some red sea bream sitting in the case and I scored the lot for under five dollars. Earlier in the day, I’d picked up a bunch of sweet spring onions at the farmers market, and with the Meyer lemons I had sitting in my fruit bowl at home, I had the makings for a great Escabeche. 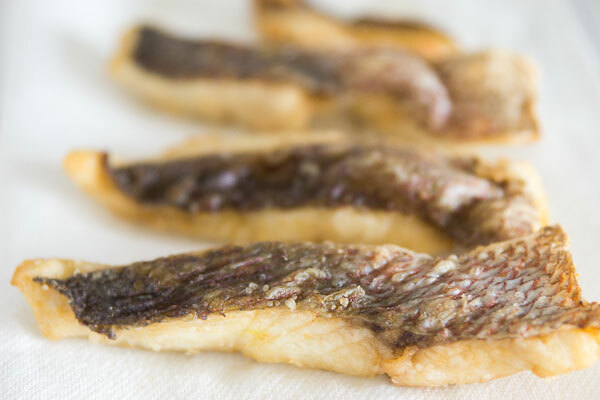 Although originally a Spanish dish, the preparation of frying meat or fish, and then marinating it in vinegar has worked its way around the world, showing up in local dishes from Japan to Jamaica. 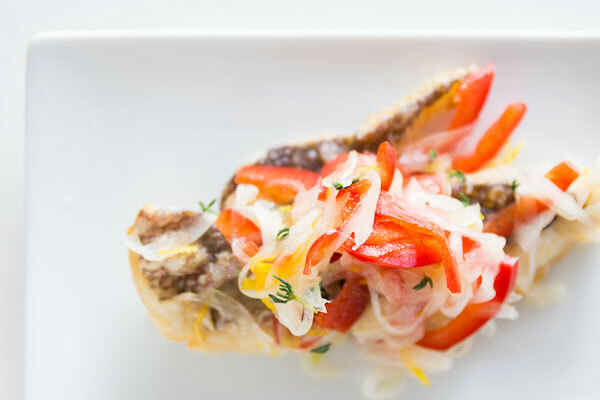 In this version, the thin flour coating helps the fish absorb all the flavors in the marinade, and the tangy onion and red bell pepper slaw creates a refreshing counterpoint to the fried fish. 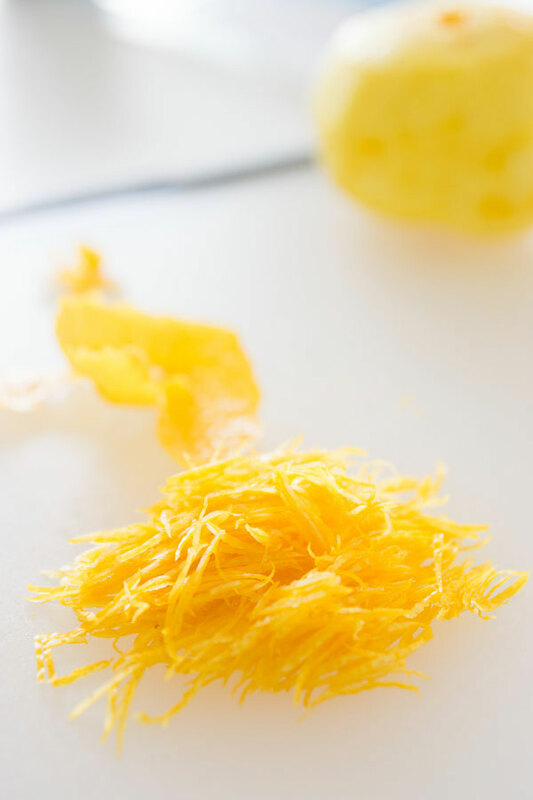 I love throwing in a bit of Meyer lemon or Yuzu juice to add a citrusy note and to keep the pungent vinegar from becoming overwhelming. The best part of escabeche is that it’s one of those dishes you can wing. It can be made with almost any kind of fish and by changing the marinade up a little you can come up with wildly different variations. Try it with lime juice, fish sauce and mint to give it some Southeast Asian flair, or throw in a shredded beet and dill for something more Eastern European. 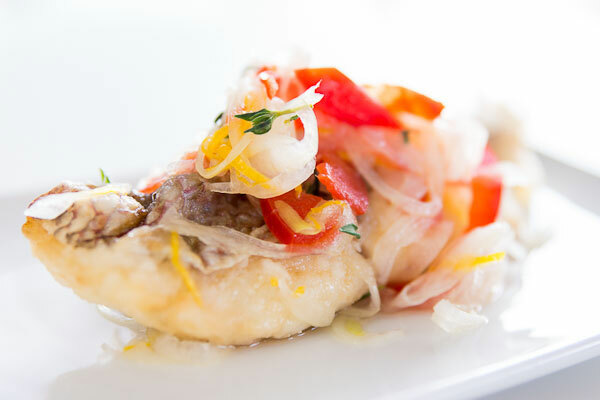 Escabeche is a Mediterranean dish that also has Spanish origins. 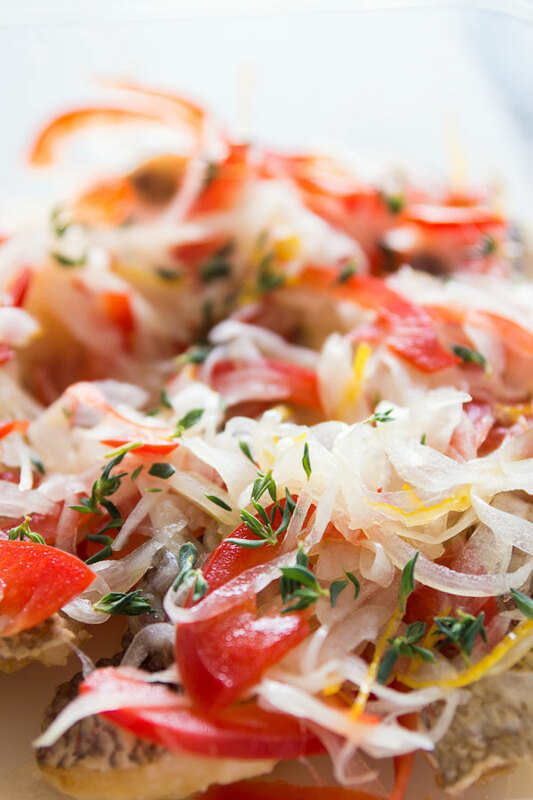 Try this sea bream escabeche recipe with red bell peppers and Meyer lemons for extra flavor. 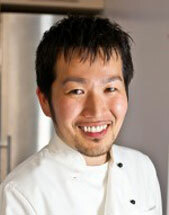 Marc Matsumoto shares his inspiration for this spin on a escabeche recipe in a full post on the Fresh Tastes blog. Pat the bream dry with paper towels, then generously salt and pepper both sides. Put the flour in a shallow bowl and dust all surfaces of each filet with the flour. In a heavy bottomed pot, add 1” of vegetable oil and heat until the oil reaches 360 degrees F. Prepare wire rack by lining with 2 sheets of paper towels. Fry the bream in batches and drain on the paper towel lined rack. Add the bell pepper, onions, lemon zest and juice, vinegar, sugar and thyme to a bowl and stir to combine. Place the warm fried fish in a shallow non-reactive container such as a Pyrex baking dish, and pour the vegetables and marinade over the top of the fish, making sure to cover it evenly with the onion and bell pepper mixture.